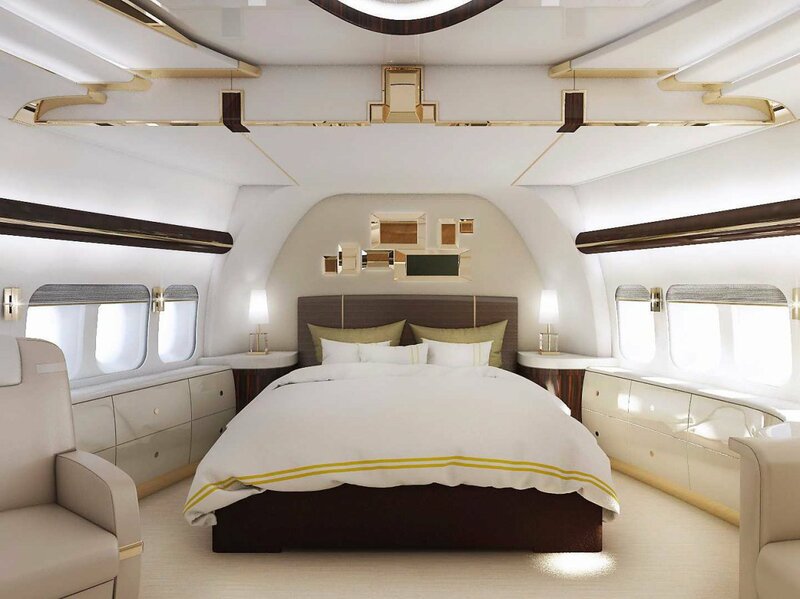 The next time you find yourself crammed in the a middle seat in coach, drinking a tiny bottle of wine in hopes of catching even a few moments of sleep, drift off to images of the life you might have lived: aboard a private Boeing 747-8. 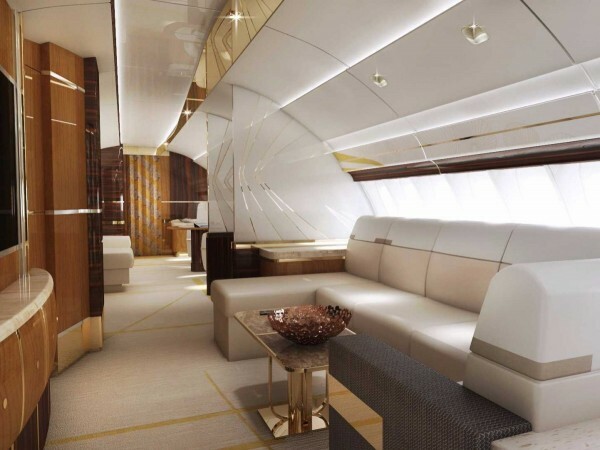 These luxury planes are bigger than many of the houses featured on this blog, with 4,786 square feet (444 square meters) of cabin space. 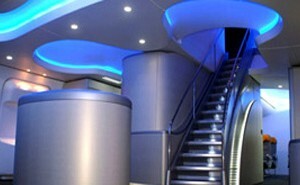 The plan in this post was built by Boeing, then finished by Kirkland, Washington-based company Greenpoint Technologies. 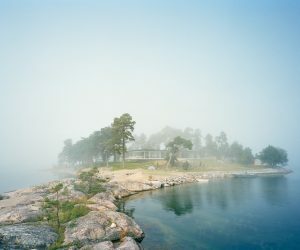 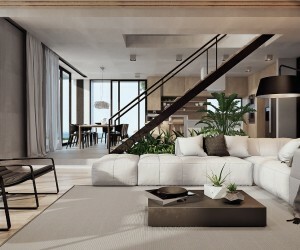 The final results are nothing to sneeze at with luxury lounges, private bedrooms, and even a full formal dining room. 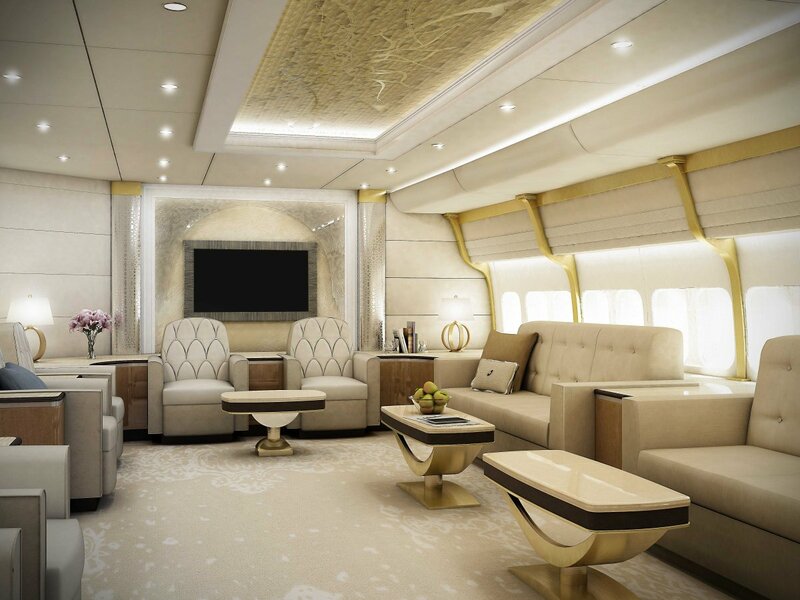 It's no wonder that the U.S. government has said it will buy 747-8s to be the next Air Force One. 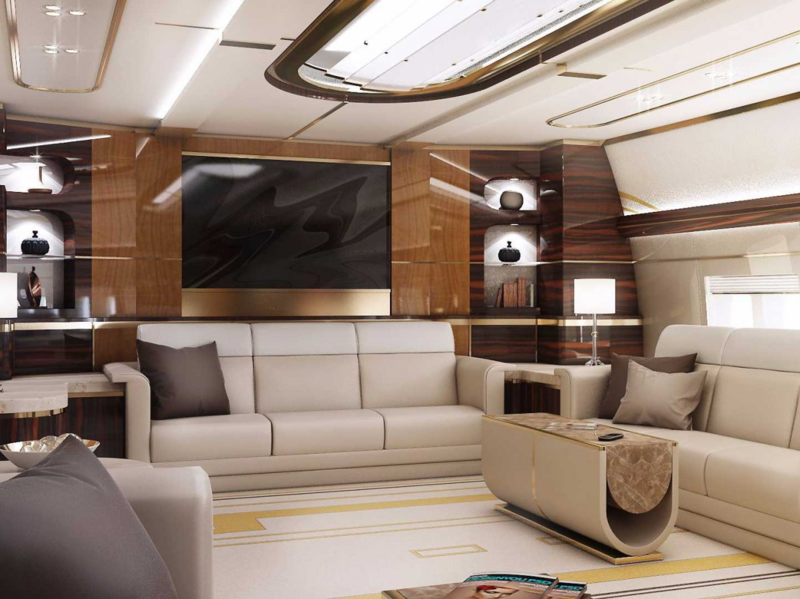 It would be surprising enough for most of us to see a sofa in a plane. 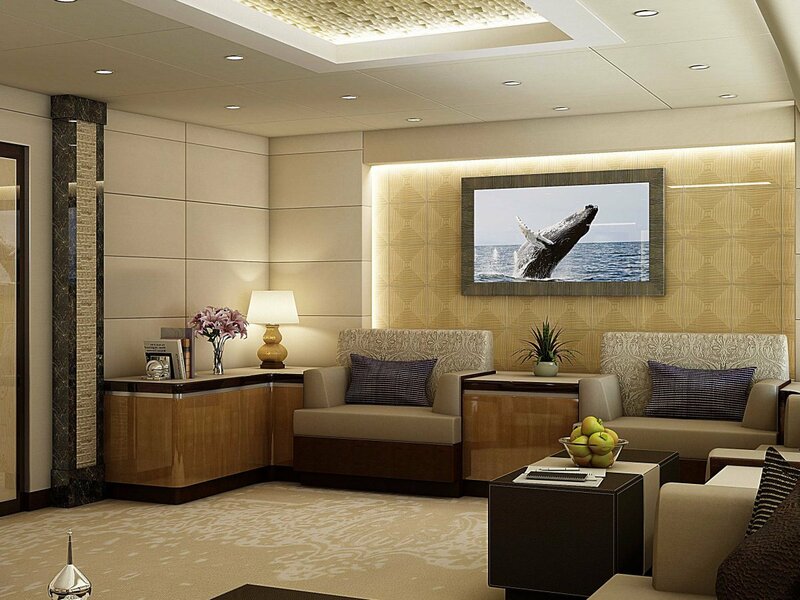 But an entire lounge with multiple sofas, a coffee table, and a wall mounted flatscreen? 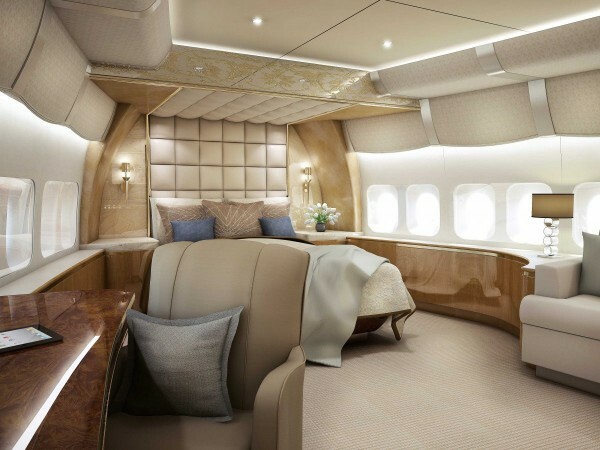 That’s a far cry from a little extra legroom. 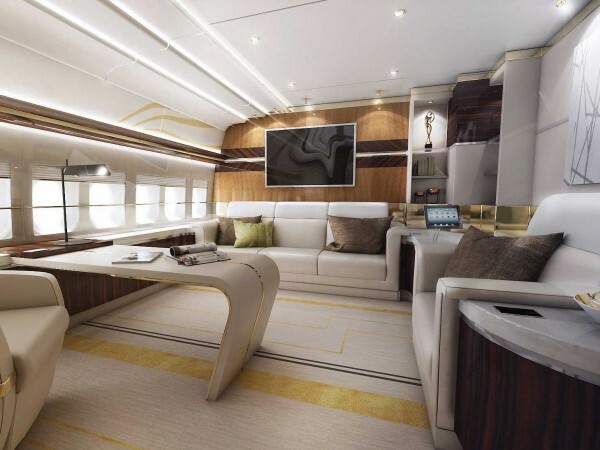 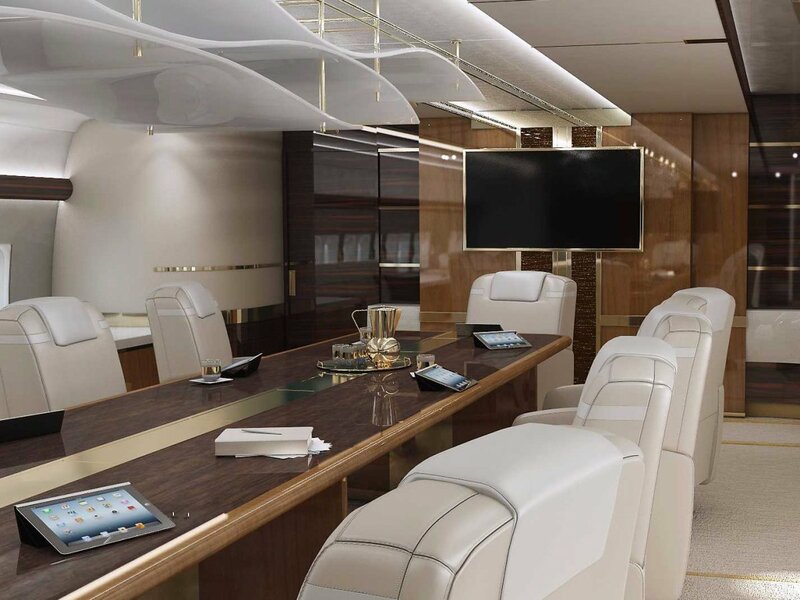 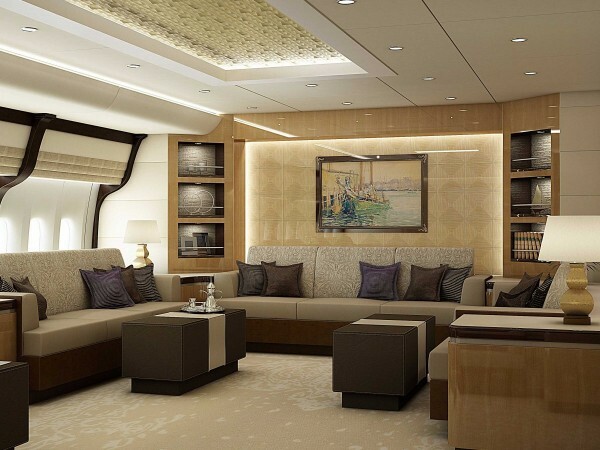 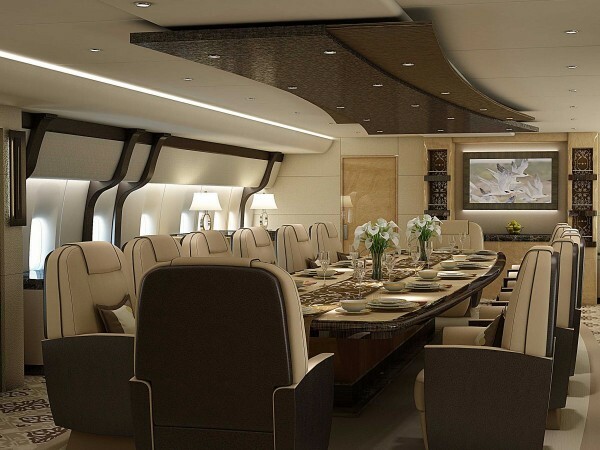 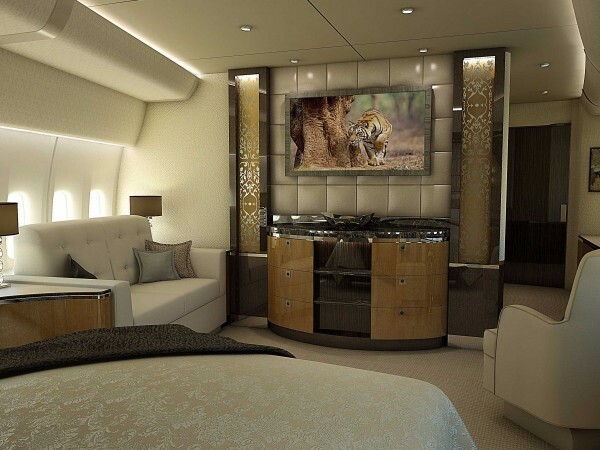 Because the planes are delivered without the finishing touches intact, it is easy to have the plane’s design customized to meet the needs of whoever is buying it – whether it’s the President of the United States or an anonymous oil baron from the middle east. 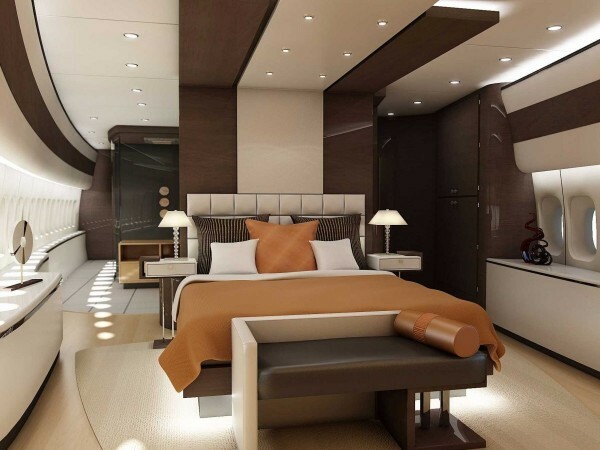 Everyone dreams of getting a good night sleep on long flights, but it’s rarely possible. 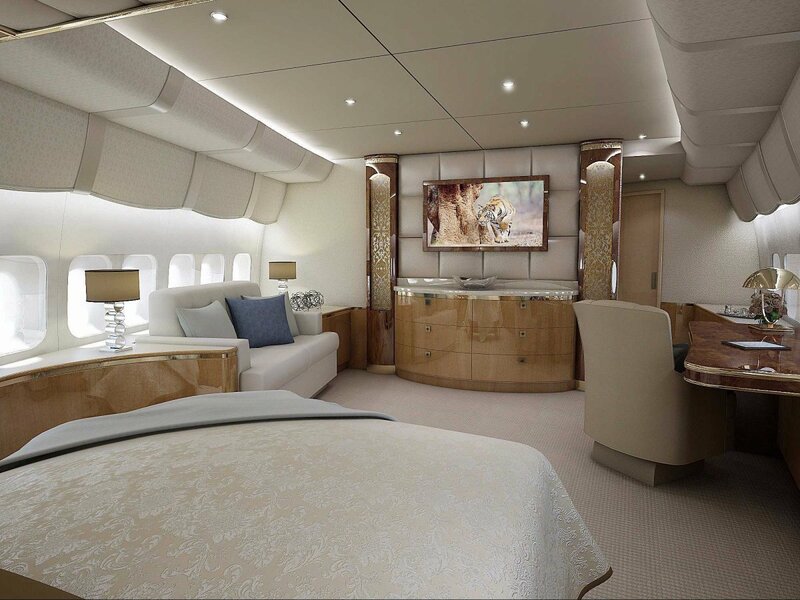 For your next transcontinental flight, those dreams could come true in a private stateroom complete with a King sized bed, blackout shades, and luxury linens. At the end of a transcontinental flight, you’ll be fully rested and ready to start ruling the world. Of course, to keep making money so that you can pay for this luxury aircraft, you’ll have to do quite a bit of work. Luckily, the plane is equipped with an office as well as a conference room (that doubles as a place for formal dining). 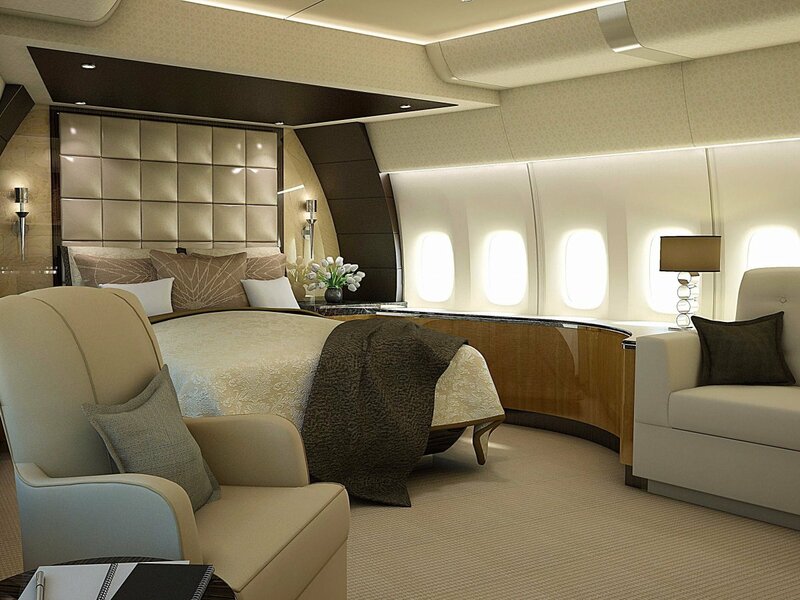 Once you wake up from that luxurious nap, you can get straight to work not matter how high off the ground you are. 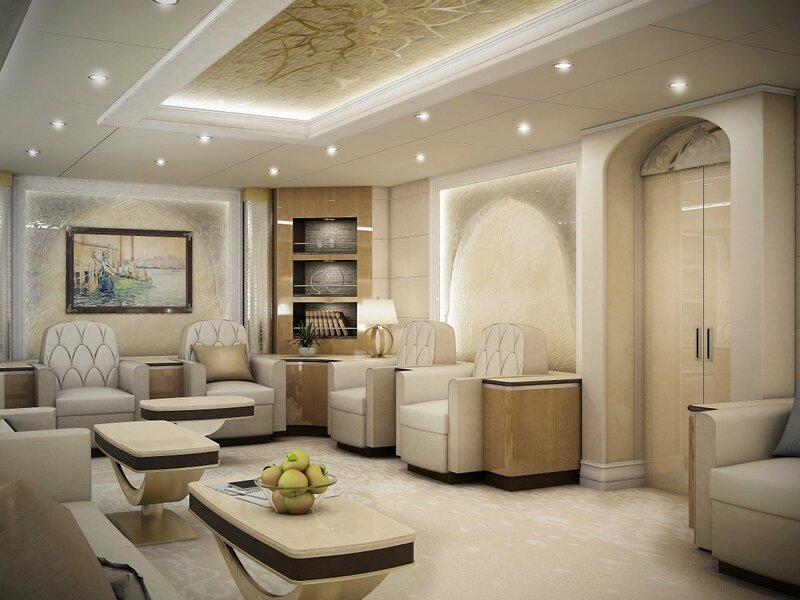 Finally, the 747-8 also has a lounge on the second level, adding another 393 square feet of lounging capabilities.